We’re big fans of finding ways to help you save time. 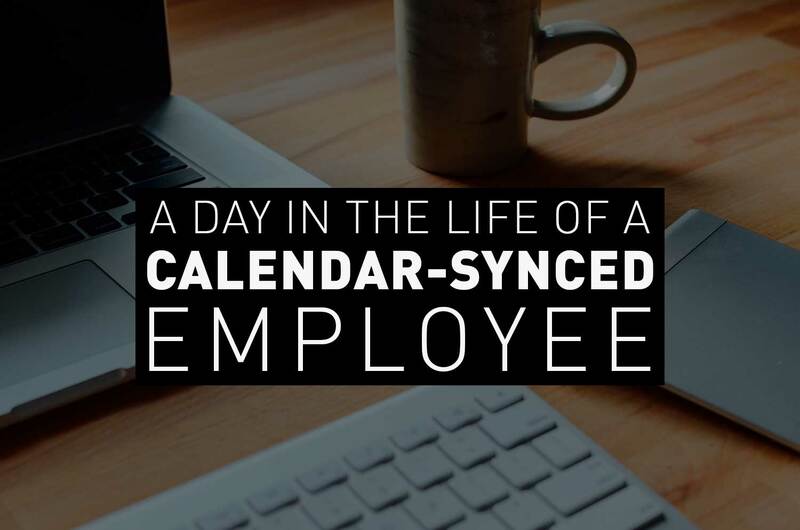 That’s why we’ve combined some of our customer success stories and case studies to create a fictional account of the different ways employees can save time using calendar sync. In it, our protagonist discusses the different ways her company uses calendar sync, and the ways in which it’s saved her and her colleagues time. She also breaks down how much time they save in an average day, week, or month, just by adopting calendar sync. It’s a great example of how micro-moments can add up to make a big difference. I get to the office, make a cup of tea, and sit down at my desk. Once my computer is booted up, I check my schedule for the day and find that Barry has added me to a meeting this afternoon. We’ve got a leak in the ceiling and need to discuss our options to get it fixed ASAP. Barry gets in about 7:30am, so he’s around to pick up on things when it’s quiet. It’s useful to him that he can still schedule meetings with us even when we’re not around as it means he can organize everything while it’s fresh in his mind. We’ve just had a new employee join our department, and she’s the first one to be calendar connected from the get-go. Our HR software scheduled meetings in with everyone on our team so that she can meet us and ask us any questions. She didn’t need to do any of the work, and it was minimal effort for the rest of us too. We have a monthly team catch up to find out what everyone’s been working on and to try and solve any problems. There’s 10 of us, so scheduling that can be a nightmare. When we got our new calendar synced software, I set up a recurring meeting at a time that works for everyone. The software even found an available meeting room and has reserved it indefinitely at 10am once a month. That means I don’t need to hunt around for a meeting room each month, and nobody risks getting double-booked. Met with Barry about the leak. He wants me to find someone to come look at it. Instead of consulting search engines or the phonebook like I usually do, I used our new booking software to find someone who can come out today. I clicked the top search result, typed in our problem, and hit submit. The software pushed our request to his calendar straight away. He received a notification about the job with all the information he needed. I’ve decided I want to spend Christmas at home eating cake and watching bad TV. I open my calendar and use my leftover vacation days for the Christmas holidays. My request is then pushed to my line manager to accept or decline. He can even see who else has booked the time off from his calendar to help him make a better-informed decision. Being calendar synced, I can block out times when I don’t want meetings organized for. Like lunchtime, when I like to go for a walk, have something to eat, or read a book. It’s the end of the year, so time to start organizing yearly appraisals. I’m in charge of that, and it used to take forever because there are so many people in the company. Our new calendar sync software makes it so much easier. All I need to do is enter who needs to attend, then it works out a mutually convenient time when a meeting room is also available. The appraisals are then automatically added to the calendars of everyone involved. I want to set up a training session about stress awareness. We’ve had the session before and it proved popular, so I’m using the same speaker again. The employees that want to attend are in a list I’ve already curated, so I put their names into the booking system, along with the name of the speaker. The software suggests January 10 as a date when everyone is free, there’s a big enough meeting room available, and there’s a screen they can use. Perfect. I accept the meeting. It’s automatically pushed to the calendars of the employees, the speaker, the meeting room, and the screen. That ensures that there are no overlaps or double-bookings. One of our team members is leaving us in a couple of weeks, so I want to arrange an exit interview with her to find out more about why she’s leaving. She’s calendar synced, so I can just enter our names into the HR software and it will work out the rest for us. Next Friday at 2pm is perfect. Minimal effort for me, no effort at all for her. Some of our team are based in our New York offices. It makes a huge difference to be able to have a virtual meeting once a week. Even though we don’t see each other very often, we still get to know one another and we know that our weekly meetings won’t clash with any other appointments. Our software also factors in time differences, so it doesn’t matter which part of the world people conference in from. Time to go home and watch Stranger Things 2. It still amazes me how much time I save each day just from using calendar sync. In some cases it may only be a few minutes here or there, but those minutes add up and can make a huge difference. Saving five minutes a day organizing meetings results in a 25-minute saving each week, or a 100-minute saving each month! I could do so much with that extra time. But it doesn’t just affect me, it affects my co-workers, too. There’s 10 of us, so we save at least 50 minutes a day by using calendar sync. In a week, we save a whole working day between us! I’m really pleased we made invested in calendar sync. Book your free Cronofy demo today to find out.